Jill and I are restoring an historic farm. Towards that end, we’ve been looking for a few old sheds to fill out our array of outbuildings. By “old,” I mean a shed about 70-100 years old. 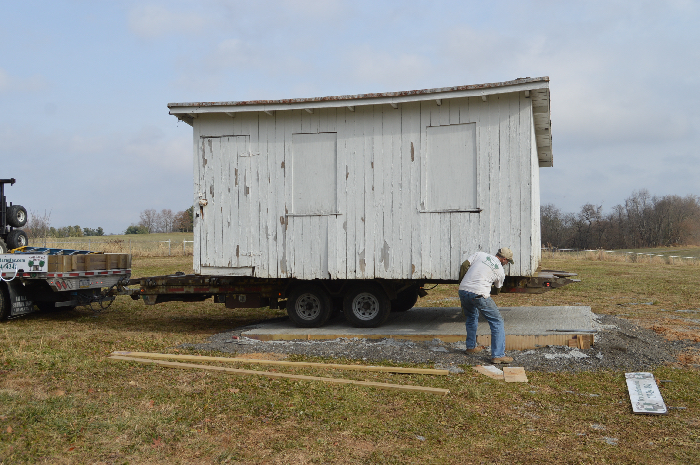 Moving a building, even a small one, is not cheap but it can be cheaper than constructing a new building. And you get something authentic in the bargain. So, we went looking for an old shed, confident that we’d find somebody to move it when the time came. 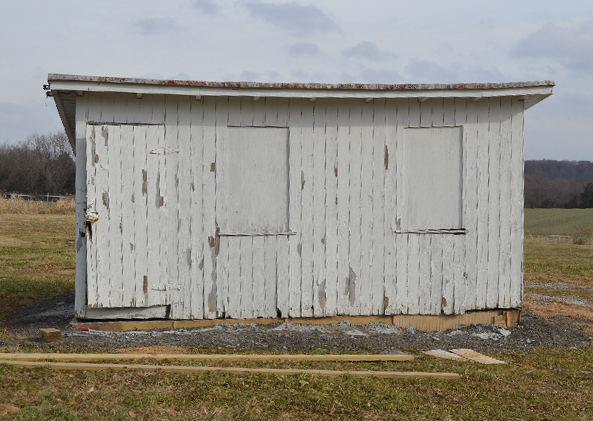 Jill pored over real estate listings, looking for old properties that had outbuildings. You’d be surprised at the variety of old sheds out there: some are downright beautiful, like miniature houses, with bead board interiors, transom windows, scrollwork detailing, and tiny fireplaces. 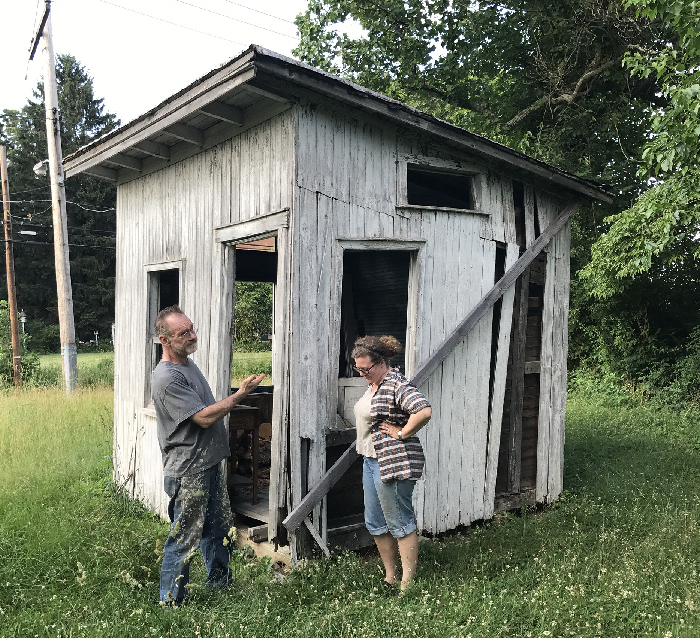 We know a fellow farm renovator who has found some of these little treasures, including an old boy Scout cabin from the 1930s, and had them moved to his property. 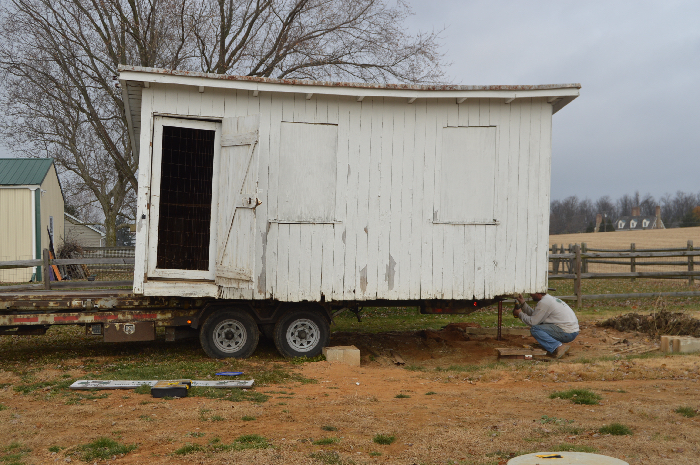 The shed we were looking for didn’t have to be fancy, just big, because we were going to use it for a hen house. We looked as far afield as Lancaster, PA, but finally found one just nine miles up the road. As we suspected, the property owner–who had just bought the house–didn’t want the old (empty) shed at the back of his yard. We gave him $200 for it. 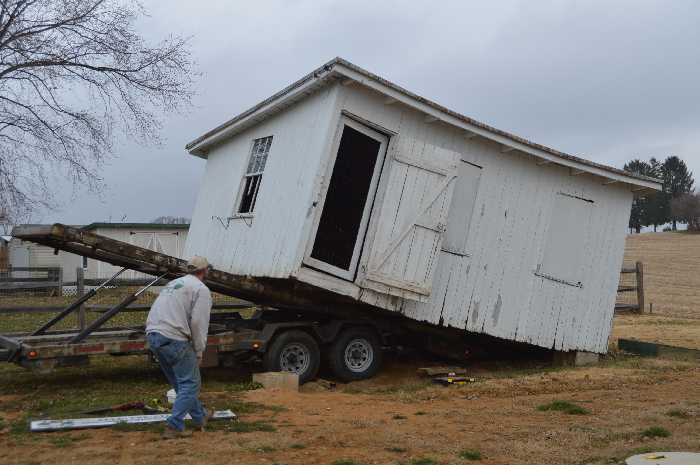 Then we looked for a mover willing to transport an old shed. Not many want the hassle. 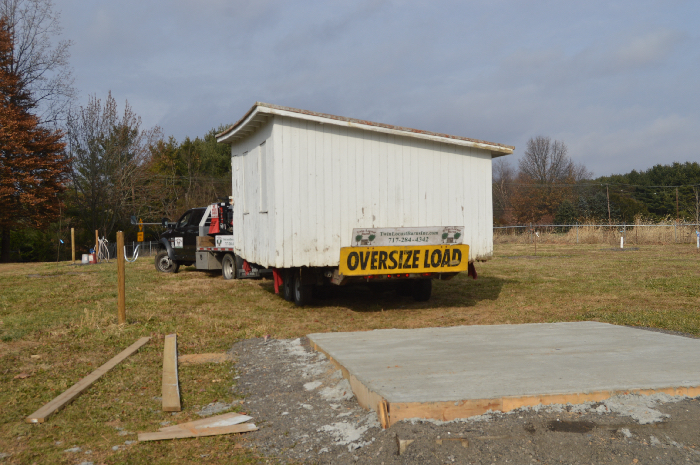 But wait: you can’t just drop an old shed onto your field. You have to build a foundation. So I poured a reinforced concrete slab, 12 x 14 feet. It took a couple of days to dig out the site, then build the form (frame) for the slab, then another day to pour the concrete. The concrete truck got mired in the mud and couldn’t get close enough to the form, so I had to tractor the concrete to the slab site. Still, with the help of a neighbor, the work went fast. But wait: now we had to find a way to get a big truck into our field. Our driveway isn’t wide enough–we needed 12-foot clearance at the road level and 14-foot clearance above. That meant I had to build a new entrance to our property farther down the road, where the trucker could gain easy access. This work took three days. All told, with searching, waiting, prepping, and scheduling, our shed search lasted 6 months. But, at last, today, we moved the shed. 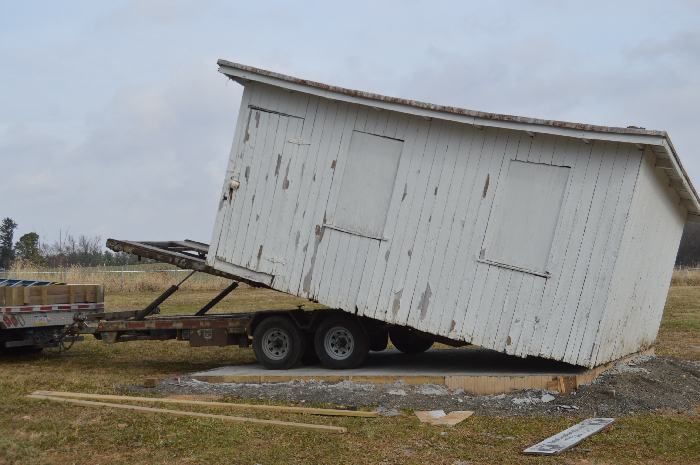 Our first fear was that the old building would fall apart as the mover edged and eased it, inch by inch, onto his big flatbed. Then, once on the road, we feared an oncoming truck would smash into our wide load. Our third fear was that the mover wouldn’t be able to get his truck through our new entrance and then what? 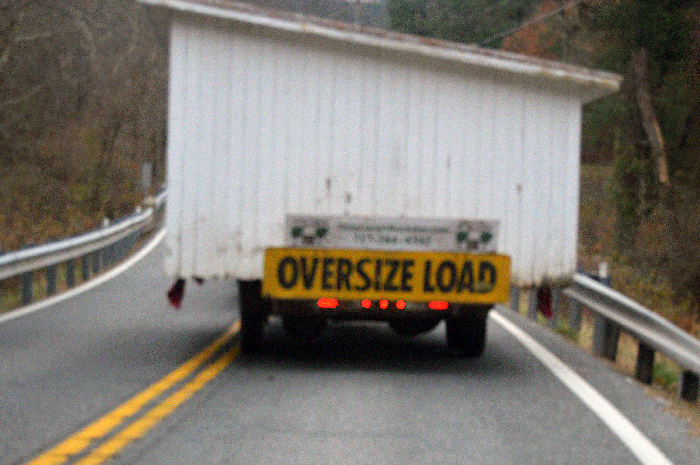 We’d be stranded on the roadway with a giant shed we couldn’t put anywhere. But everything went right, well, and fast. It was amazingly good fortune: maybe because it was my birthday? Now, the shed–our hen house–sits firmly on its foundation, so firmly, in fact, that the sag in the roof straightened out considerably. Looks like that old shed came with the farm. Now comes the fun part: fixing it up!